The SF3 Tuner increases horsepower and toque in your Ford, Lincoln, or Mercury Car, Truck or SUV with SCT's pre-loaded dyno proven tunes. And programming one of these pre-loaded SCT tunes is as easy as 1-2-3. Just plug the SF3 Tuner into your vehicle's OBDII port and choose from one SCT's pre-loaded performance or fuel economy tunes, and within minutes the SF3 programs your vehicle. The SCT SF3 Power Programmer has a huge backlit display, making it EASY to read the Built-In Data Logging or Real Time Monitored Vehicle Data. The SCT SF3 allows you to view popular sensor data like EGTs, as well as Air / Fuel Ratio and more. When the SF3 Power Flash device is plugged into the vehicle, it backs up your vehicles factory programming. 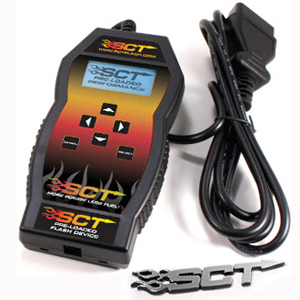 The SCT SF3 Tuner will always keep a copy of your factory tuning should you ever need to return your vehicle to the stock. Returning your vehicle to the stock is as easy as selecting "Return to Stock" on the SF3 Power Tuner. Stores up to 3 custom tune files created by your local SCT Custom Tuning Dealer. Most popular Ford vehicles supported including 2011 models. Allows you to change the transmissions shift pressure. Controls how firm the shifts will feel. * Vehicles with Automatic Transmissions ONLY. Vehicle Programmers is an Authorized SCT Dealer. Only SCT products bought through an authorized dealer will include the support and warranty through SCT Performance. Vehicle Programmers sells at MAP pricing. What does that mean to you? MAP pricing is the lowest price that we can sell your item without violating SCT pricing policies, and without voiding your warranty. If you ever find a product for less than our listed price, more than likely it is an unauthorized dealer or refurbished units. We highly recommend you think twice before altering something as important as your vehicles computer with these products. We ship LIGHTNING FAST! We don't wait around for days waiting to ship your new SCT Tuner. In fact, we don't wait around at all. At Vehicle Programmers, we guarantee to ship out within 24 hours of your purchase (excluding weekends and holidays), and in most cases we will ship within an hour of your purchase. And better yet, we ship from 4 different warehouses across the country, so we always ship from the one closest to you. This allows us to get the product to you even faster. Once you click the "Add to Cart" button, you better start watching the mail box, because your new tuner is on it's way! This item is returnable for 30 days after the date of purchase. See our No Hassle Return Policy.